It was Sunday morning and Kate was determined to have her Sunday morning sleep in. Me, you know what I’m like. I can’t sleep in at the best of times let alone when I am in a different city. I thought about heading out for a run, but instead yesterdays invader find prompted me to do a little research and get out on the hunt for some more. 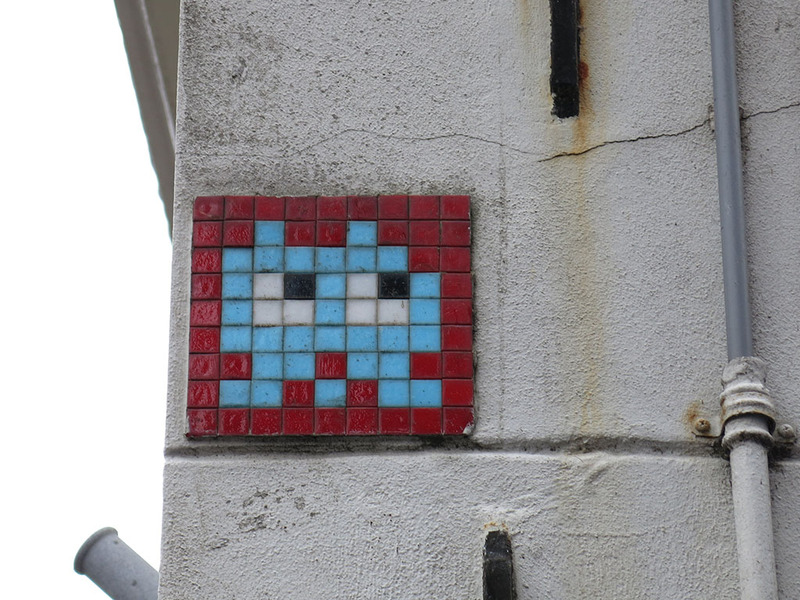 It seemed that Invader had spread his work about the city a few years ago and some still remained. While details of exactly where were a little difficult to find, a combination of websites and a Google Map was enough to give me some locations to visit and see if I could find those cool little guys. So with Kate having a relax, I was off with my marked up map. I had a bit of ground to cover. The plan was to do a bit of a clockwise circuit, heading roughly in the direction of Jordaan to kick things off. My map had the suspected location of invaders, some of which were known to have disappeared now, some only rumoured to be there, and some apparently still alive and well. All I was going to be going off was a rough location and my keen eagle eyes. In no time at all I found my first. On a corner next to the Leidesgracht canal was one in almost perfect condition. Score! 10 points! My journey took me into a district we hadn’t really visited yet, the Jordaan area. We had skirted the edge on our first night when we wandered to visit Anne Frank’s house, as the Prinsengracht canal is actually what separates the old “working class” area from the more affluent ones in Amsterdam central. Today Jordaan is like our Collingwood or Fitzroy in Melbourne… working class suburbs now full of cool hipster cafes, thrift stores, record stores and the like. As a consequence there is also a bunch more street art. And it was as I entered this area I came across Invader #2. 10 points! This guy was on the corner of Lauriergracht and Hazenstraat. My map had it as a maybe but it was a definitely! Another one in great condition, especially cool as it is in an easy to reach spot. The next couple I was looking out for were also just maybes, so I casually wandered through Jordaan. My luck was with me today… another Faile! As you remember I found one on our first day by accident, and so to this one as well. My force was obviously strong today! This was another great one, and an even more classic Faile image. I wondered if there were more about the city. I explored Jordaan some more, alas finding more record stores than Invaders. In fact I couldn’t uncover any more. Oh well, maybe they just didn’t exist any longer. 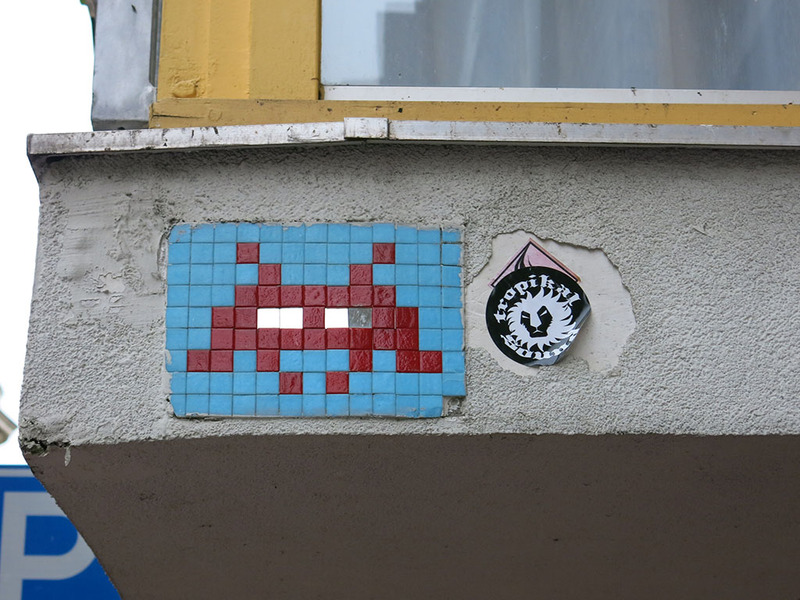 That is the thing with Invaders… those little coloured tiles actually don’t last all that long a lot of the time. As evidenced above. This one was in an archway just near the main Dam. Was being the word. I spent a few minutes trying to find this one, that my map was sure was there. And then I saw the outline of where this character used to be. Too late, he was now gone for good. I skirted the edge of the red light district again, a different place at about 12pm and not 12 in the AM. 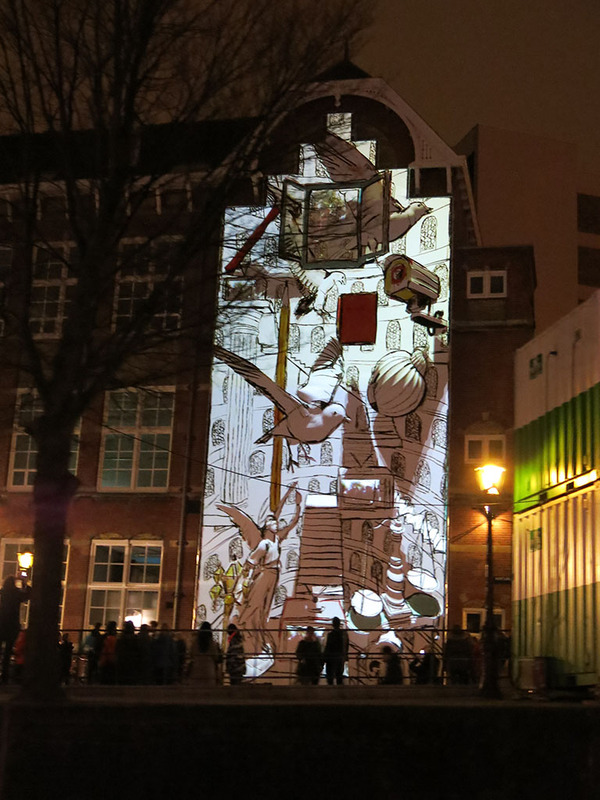 I made my way into Sint Antoinesbreestraat looking high and low for the next little creature. Before finding it I did chance upon a rad record store. I wasn’t planning on buying any records… they truly are a pain to travel with. But how could I resist filling my Bowie collection? As a somewhat recent convert to Bowie (mostly early) I had been looking at getting the classics on vinyl. The current $300+ boxset was tempting, but all I really wanted out of it was Ziggy Stardust, Aladdin Sane, and Hunky Dory. As my luck would have it, this record store had broken up a box set and was selling the individual albums for reasonable prices. Yes! So all 3 were now mine (and mine to work out how best to take them home). Listening to these will always now remind me of Amsterdam. I headed back out into the street, and in only 30 seconds or so I found #3! This guy was also looking good, but he was up a little higher meaning he was harder to reach. The mirror eyes were an especially nice touch. I had been going for quite a while, taking my time, so I decided to up the pace a little. The next one on the map was in a pretty generic location that didn’t make much sense. 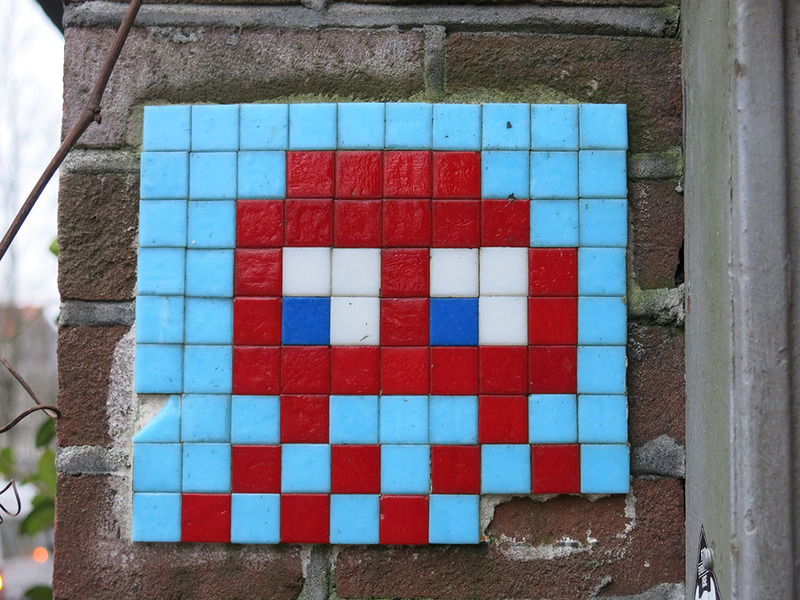 Knowing Invader and his work, when in doubt, also try bridges as they are a favourite spot, and given we were in Amsterdam, they are a good spot to investigate. Bingo! Number 4 was not in the easiest place to spy or photograph, but there he was. 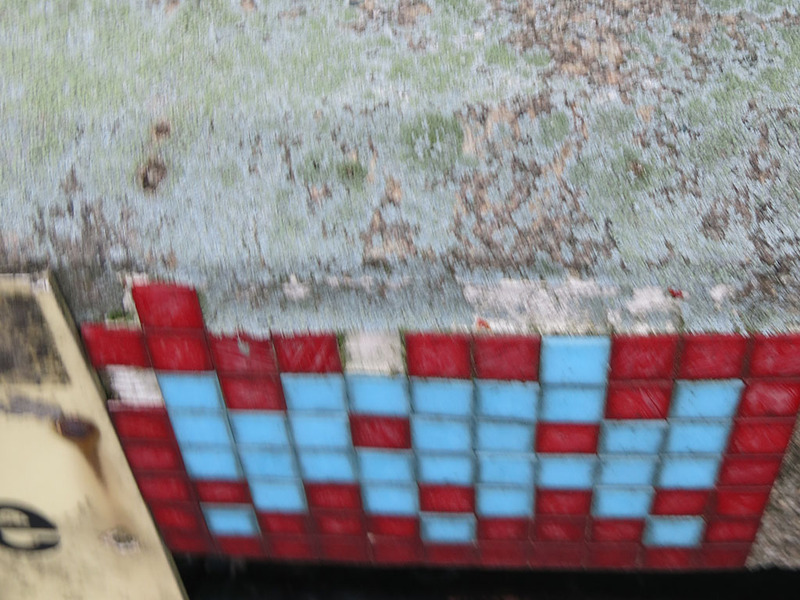 I tried to get a close up shot, but I didn’t fancy the way I was dangling my camera over the side of the bridge (well, didn’t fancy my non-klutz tendencies) so had to make do with the blurry shot. But 10 more points! Number 5 was just around the corner and on a bridge I had heard one was on, the Blauwbrug. Kate and I wandered over this bridge earlier in our travels, and I had half heartedly had a look but was unsure if this was the bridge. Well it was indeed and it was in a fairly obvious spot in the end. Again, not one that was easy to photograph well, but certainly less precarious! 10 more points for me. Number 7 was just down the street a little. This was a different one as it was quite low, next to a car park entrance. As a result it is a bit more damaged, but still mostly together. 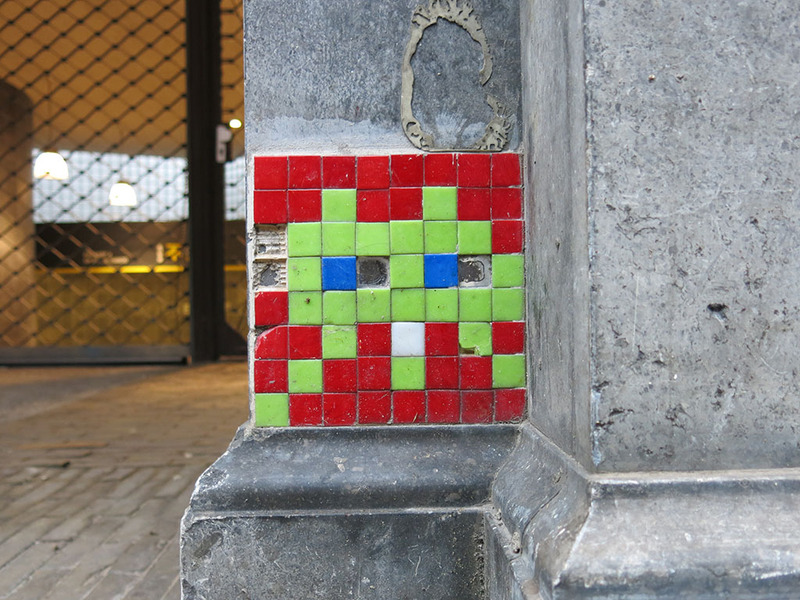 The thing is with these guys is that Invader uses a type of glue that really makes it impossible to steal the works. You either have to leave it or destroy it. As a result only a few tiles were missing, so still looking pretty good. In the end my total for the day was 8, with the luck last being on a bridge only a few minutes from our hotel, again on Neuwe Spiegelstraat (down near Prinsengracht). A bit hard to get a photo, but I like how this one turned out. And with that, almost 3 hours later I arrived back at the hotel with 8 invaders (and a Faile) under my belt. Such a good morning of exploring… a great way to orient myself a bit more and explore previously unexplored parts of the city. Kate was up for some action so we decided to get out and explore some more art, this time the rest of the Rijksmuseum. We had previously done the main rooms and seen the big ones from Vermeer and Rembrandt, but this time we wanted to visit the rest. As I had mentioned, the Rijksmuseum is an interesting one for how it combines painting, sculpture, furniture and an assortment of things all together. 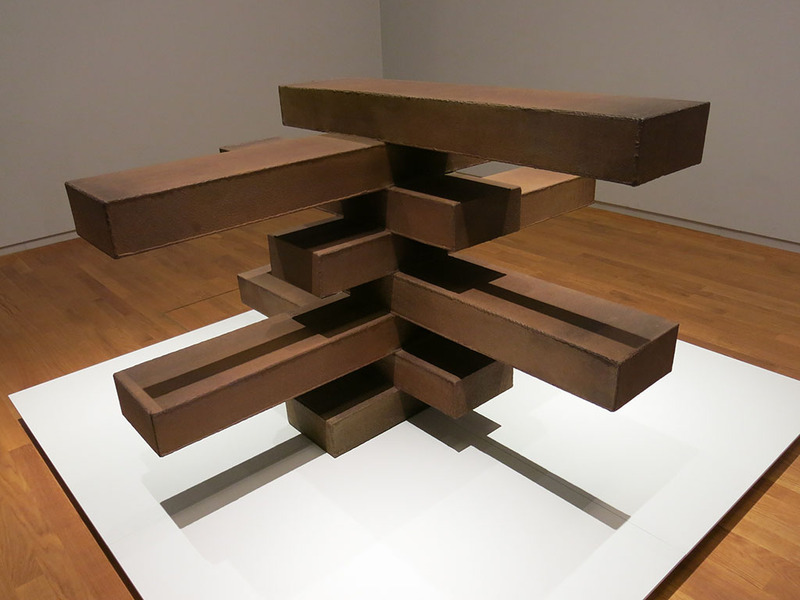 Well, it is also interesting in that it also incorporates some 20th century art into the collection as well. The smaller rooms on the 3rd floor were from 1900 onward and sought to highlight Dutch contribution to this. So of course Mondrian featured, as did a few modest Van Goghs that had made their way from the near by Van Gogh museum. I also discovered this huge stack of Kit Kats. Well, not Kit Kats, but they say all art is in the eye of the beholder don’t they? So I saw Kit Kats. It was approaching closing time when we finished up. I loved the Rijksmuseum. Not nearly as daunting in size as many other museums, but still with an amazing collection and the focus predominantly on Dutch work meant it also kept you focused. A highlight. The sky was a bit cloudy but there was no rain in sight, so Kate and I decided tonight was the night to get out and see the Light Festival proper. We could either walk one section, or elect to jump on a canal boat (conveniently just opposite the hotel) to see the bulk by water. With the allure of an open boat and gluhwein, we elected for the latter. 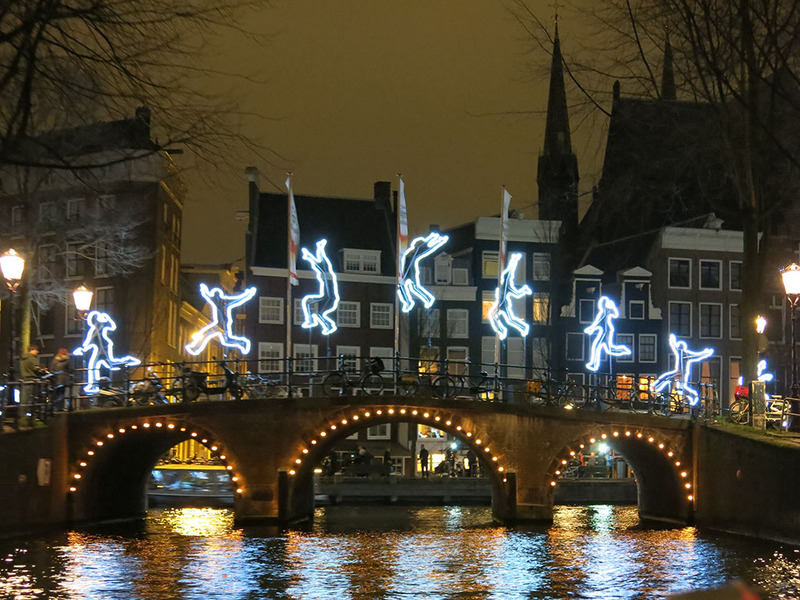 So at 7pm onto the boat we jumped and made our way around the canals again, this time on a route designed to visit all the light installations. 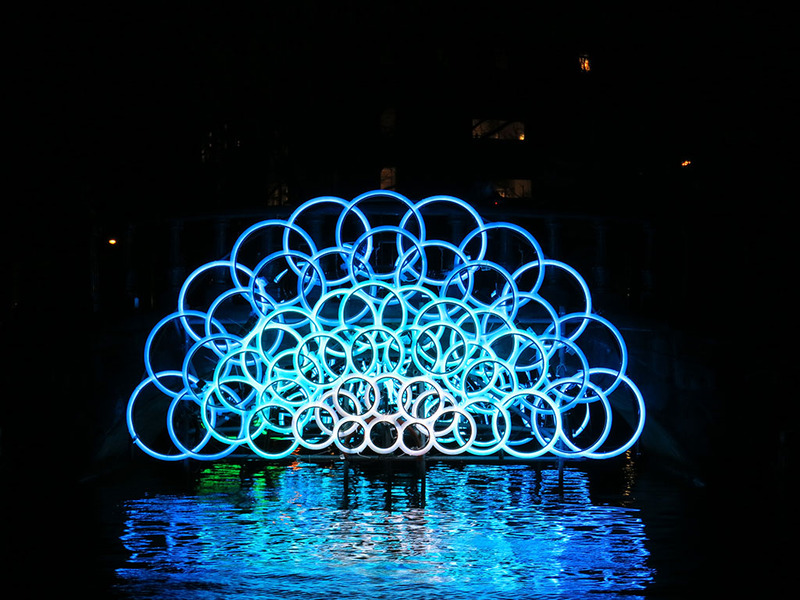 I guess it could be considered to be like Vivid in Sydney, but this had the good fortune of the immense network of canals to inspire the artists. So over an hour and half we saw a good 15 or so installations. 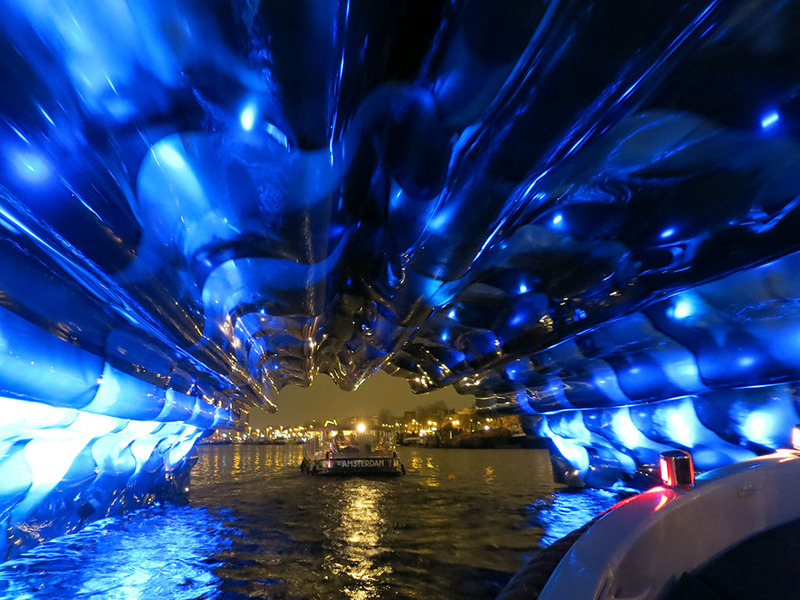 They ranged from the “wow!” to the “meh”, but it was so nice to be in an open boat, slowly cruising the canals, experiencing the installations, on a relatively mild night. It is one of the best things we have done in Amsterdam, and it was also cool to see the hoards wandering about the canals experiencing them all as well. No doubt we would be checking them and the others we can’t see from the water on foot too. Above are a bunch that we saw. Of course photos don’t do the justice… it is all about experiencing them up first hand… but hopefully you get the idea. It was also nice to see the canal houses again. It is amazing that people are still able to live in some of them… the wonkiness of them being totally mind boggling! It was getting close to 9pm when we arrived back at the hotel. No need to top that tonight… but undoubtedly we would try something new tomorrow.